The San Antonio Spurs had a comfortable victory over the Miami Heat last night to win the NBA title. Bermudian Matthew Herring can take pride for playing his role as a strength and conditioning coach for the team in helping them win the championship. 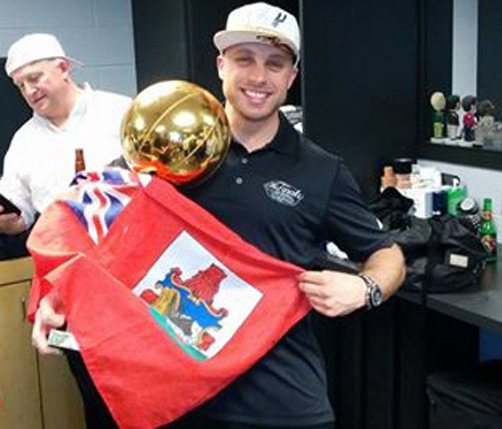 The Spurs won 104 to 87 to take the best of seven series four games to one and Herring was relishing being a part of the World Championship club that boasts stars Tim Duncan, Tony Parker and Manu Ginobili, among others. Herring’s Facebook was filled with congratulations from family and friends after Sunday night’s historic win. Herring said on his Facebook page: "Last team standing! I'm drenched in champagne!!! Go Spurs Go!!!!" Herring told the Bermuda Sun earlier this year the “humble” nature of the players he spends hours on the road with is key to their success. He said: “In terms of the ‘Big Three’, I see them every day for hours on end and think of them primarily as friends and colleagues.